Added by Citizen Reporter on March 21, 2018. On Monday, Michigan Gov. 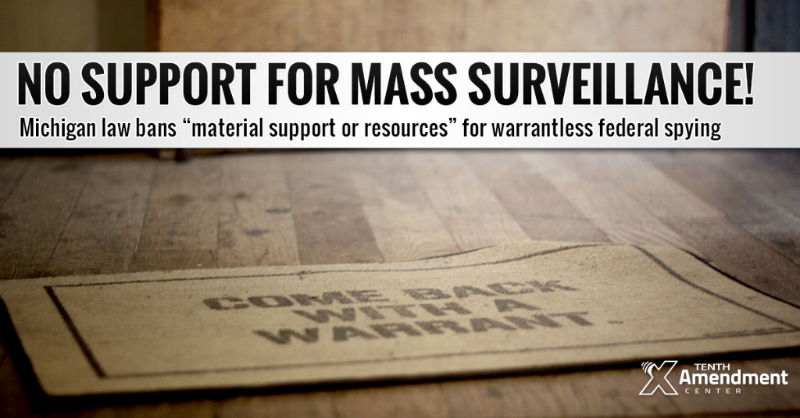 Rick Snyder signed a bill that bans “material support or resources” for warrantless federal surveillance programs. This is an essential step every state needs to take at a time when the federal government seems unlikely to ever end unconstitutional spying on its own. Over the last few years, we’ve seen more nullification bills introduced – and PASSED – than at any time in history. But with thousands and thousands of unconstitutional federal “laws,” rules, regulations, acts and orders on the books, we’ve got a LOT of work to do. We can only get the job done with your help! TAC memberships are the #1 way we build the financial resources needed to get this kind of work done. As little as 2 bucks a month makes a difference. Would you please join us today? Thank you for reading, we are extremely grateful for your support!